Background: Composite resin, serves as esthetic alternative to amalgam and cast restorations. Posterior teeth can be restored using direct or indirect composite restorations. The selection between direct and indirect technique is a clinically challenging decision-making process. Most important influencing factor is the amount of remaining tooth substance. Aim: The aim of this systematic review was to compare the clinical performance of direct versus indirect composite restorations in posterior teeth. Materials and Methods: The databases searched included PubMed CENTRAL (until July 2015), Medline, and Cochrane Database of Systematic Reviews. The bibliographies of clinical studies and reviews identified in the electronic search were analyzed to identify studies which were published outside the electronically searched journals. The primary outcome measure was evaluation of the survival of direct and indirect composite restorations in posterior teeth. 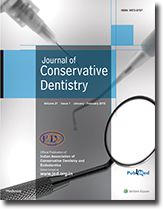 Results: This review included thirteen studies in which clinical performance of various types of direct and indirect composite restorations in posterior teeth were compared. Out of the thirteen studies which were included seven studies had a high risk of bias and five studies had a moderate risk of bias. One study having a low risk of bias, concluded that there was no significant difference between direct and indirect technique. However, the available evidence revealed inconclusive results. Conclusion: Further research should focus on randomized controlled trials with long term follow-up to give concrete evidence on the clinical performce of direct and indirect composite restorations. 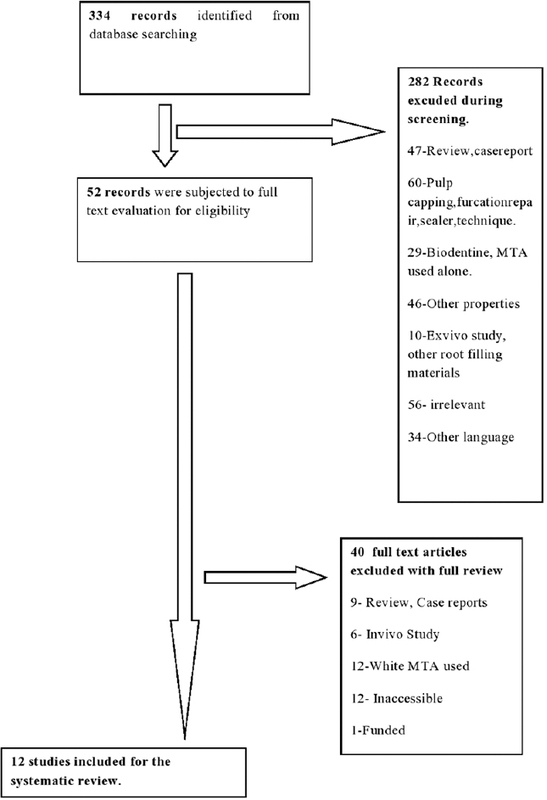 Introduction: This systematic review intended to compare the biocompatibility and sealing ability of mineral trioxide aggregate (MTA) and biodentine as root-end filling material. 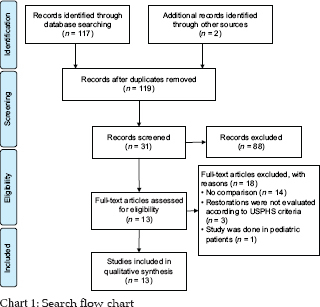 Materials and Methods: A computerized literature search was performed on March 1, 2016, in MEDLINE, PubMed, and COCHRANE LIBRARY for data published from January 2011 to March 2016. Quality assessment of the selected studies was performed according to the PRISMA guidelines, 2009. Results: A total of 12 in vitro studies were included in this review. Of these, four studies compared the biocompatibility and eight compared the sealing ability. With regard to biocompatibility, two articles showed biodentine to be better and two showed comparable results, while in the case of sealing ability, one article showed MTA to be better, six articles showed biodentine to be better, and the rest one article showed the comparable result. 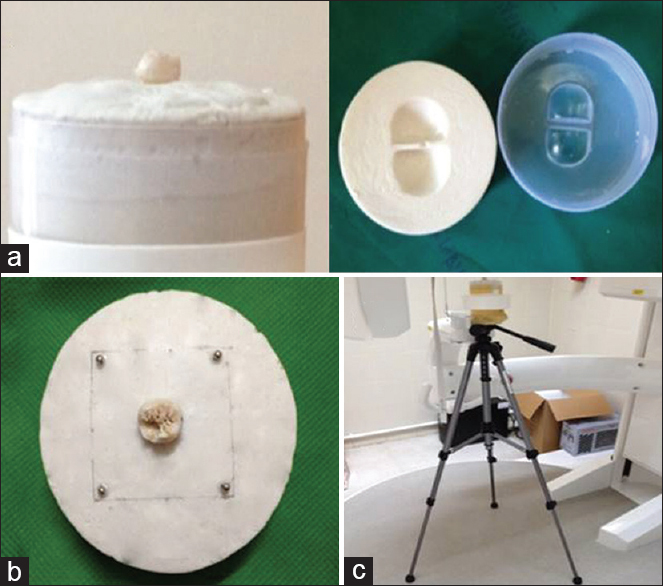 Conclusion: It may be concluded that good sealing ability of biodentine along with its favorable biological properties show that materials can be used competently in clinical practice as a retrograde filling material. However, long-term assessment in clinical situations is necessary for further inferences. Context: Eroded dentin might present the opening of dentinal tubules, increasing permeability, and consequently dentinal hypersensitivity. 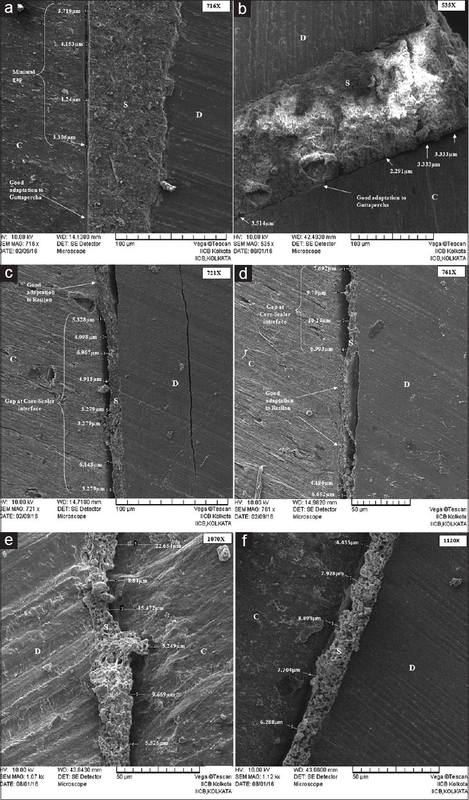 Aims: This study evaluated the permeability of dentin surfaces exposed to different levels of erosion and methods of surface protection. Materials and Methods: Dentine samples (3 mm × 3 mm × 1 mm) were prepared from bovine incisors (n = 90) and divided into three groups according to the method of controlling erosive challenge: Negative control, topical fluoride application, and glass ionomer sealant. Subsequently, they were randomly divided into three subgroups according to the exposure of simulated gastric acid solution (Demineralization – DES) (5% HCl, pH = 2.2), and remineralization (RE); negative control, 9 and 18 cycles DES-RE. The dentin permeability was measured by assessing the hydraulic conductance (μl/min.cmH2O.cm2). Statistical analysis was performed by two-way ANOVA and Tukey's test. Results and Conclusions: Greater permeability was observed after 18 erosive cycles, followed by exposure to 9 cycles and negative control (P < 0.0001). The application of glass ionomer sealant resulted in a major reduction of the hydraulic conductivity, regardless of the erosive challenge. Control groups and topical fluoride application showed similar results. In conclusion, the severity of erosive challenge contributed to the increase of dentin permeability. Besides, the glass ionomer sealant was the only protection agent that promoted significant effects in dentin permeability. Aim: The aim of this study was to evaluate the cytotoxicity effects of experimental gypsum-based biomaterial prepared with various concentrations of chitosan (Gyp-CHT). Materials and Methods: The study was performed using cell viability assay for mitochondrial dehydrogenase activity in stem cells from human exfoliated deciduous teeth (SHED), after 1, 2, and 3 days of exposure to the biomaterial extracts of varying concentrations. Differences in mean cell viability values were assessed by one-way analysis of variance, followed by Dunnett T3 post hoc test for multiple comparisons (P < 0.05). Results: The cell viability to Gyp-CHT in low extract concentrations was statistically similar to that of the control and different from that of high extract concentrations. Gyp-5% CHT showed the highest percentage of cell viability with 110.92%, 108.56%, and 109.11%. 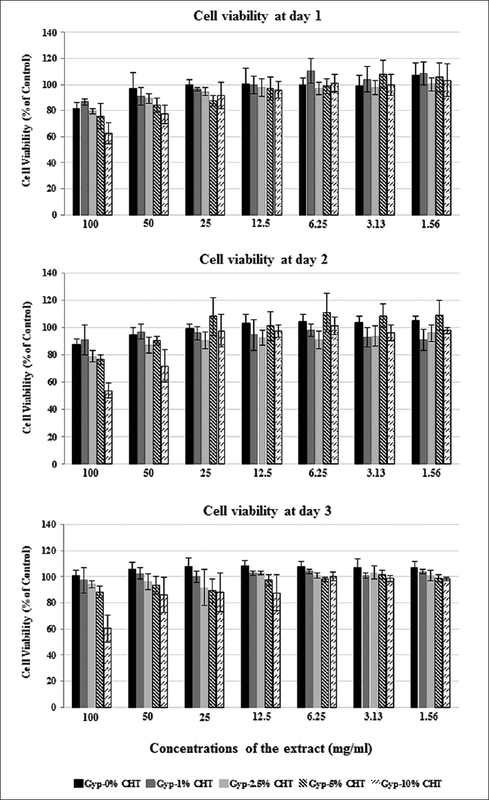 The cell viability showed a tendency toward increment with low extract concentration and no constant effect of CHT on cell viability toward higher or lower. Conclusions: Gyp-CHT biomaterial has no cytotoxic effects on the cultured SHED. Purpose: Composite resin restorations are normally replaced after the internal bleaching of endodontically treated-teeth because the bleaching agent does not alter the color of the restorative material. This study evaluated the effect of 10% sodium ascorbate (SA) applied at different protocols on bleached dentin. Materials and Methods: One-hundred slabs of intracoronary bovine dentin were divided into 5 groups: 2 controls-GI without bleaching (positive), GII bleached with 35% hydrogen peroxide (HP) (negative); and 3 experimentals – GIII. 35% HP + SA at protocol 1 (dripping, washing and drying the solution), GIV. 35% HP + SA at protocol 2 (dripping and aspirating the solution) and GV. 35% HP + SA at protocol 3 (dripping, rubbing and aspirating the solution). Sixty fragments were restored and subjected to shear bond strength test (n = 12). Forty fragments (n = 8) were prepared for chemical analysis (energy dispersive X-ray spectrometry) and surface morphology (scanning electron microscopy). Data were analyzed by ANOVA and Tukey test (P < 0.05). Results: GI (3.169 ± 1.510a) had the highest means values, similar to GIV (2.752 ± 0.961a) and GV (2.981 ± 1.185a) (P < 0.05). Inferior values were obtained in GII (1.472 ± 0.342b) and GIII (2.037 ± 0.742ab) had intermediate values (P > 0.05). Oxygen concentration was reduced in groups treated with SA, and the surface exhibited residual granules of the solution. Conclusion: The 10% SA solution reestablishes the bond strength of restorative material to bleached dentin, especially if active protocols of application and aspiration were used. Aim: The aim of this study is to compare curved root canal preparation between reciprocal rotary files and rotational rotary files in extracted teeth using cone-beam computed tomography (CBCT). The independent variable was the file type (reciprocal vs. rotary), and the primary outcome variable was the centering ratio of distance change after canal preparation. Secondary outcomes were canal transportation in extension and direction and the preparation time. Materials and Methods: Forty mesial root canals from extracted permanent molars with curvatures ranging between 25° and 45° were randomly divided into 4 groups. Canals were prepared with two types of reciprocal rotary files (WaveOne and Reciproc) and two types of rotational rotary files (ProTaper and Mtwo), ten canals in each group. The root canals were scanned before and after preparation using CBCT. Group differences in outcome variables were tested using ANOVA and 5% type I error probability. Results: At the middle third of canals, reciprocal rotary files yielded the least amount of deviation from the center in inner–outer furcal direction (P < 0.001). Transportation was shown from the original canal shape in all directions in four groups. The reciprocal rotary files took the least amount of preparation time as well (P < 0.001). Conclusions: Reciprocal files result in less transportation and working time than the rotational files. Background: This article highlights the contribution of collagen structure/stability to the bond strength. We hypothesize that induction of cross-linking in dentin collagen fibrils improves dentin collagen stability and thus bond strength with composite also improves. Aims: The aim of the study was to evaluate the effect of collagen cross-linking agents on the shear bond strength of composite resins. Subjects and Methods: One hundred human permanent teeth were randomly divided into three groups: Group I (n = 20) – no dentin pretreatment done, Group II – dentin pretreatment with 10% sodium ascorbate for 5 min (IIa) and 10 min (IIb), and Group III – dentin pretreatment with 6.5% proanthocyanidin (PA) for 5 min (IIIa) and 10 min (IIIb). A composite resin was bonded on prepared surfaces and cured. Thermocycling was done, and shear bond strength of the prepared samples was tested using a universal testing machine. Results: Values of Group I (control) were lowest whereas that of Group II (sodium ascorbate) were highest. The following order of shear bond strength was observed: IIb > IIa > IIIb ~ IIIa > I. Results for sodium ascorbate were found to be time dependent, whereas for PA, differences were nonsignificant. 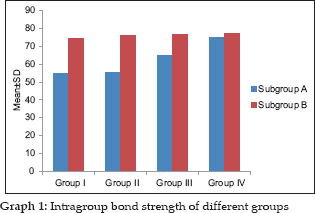 Conclusions: Treatment of dentinal surfaces with collagen cross-linking agent increases the shear bond strengths. Aim: The study evaluated the antibacterial effects of dental restorations such as nano-hybrid composite (Empress), a glass ionomer cement (GIC Gold label Type 9) and silver amalgam against Streptococcus mutans. Materials and Methods: A modified bacterial suspension within the material assay was used to study the antibacterial effects. A volume of 20 μl of bacterial suspensions were placed in a narrow conical cavity within the materials. They were incubated for 0, 3, 6, 12, 24, and 48 h at 37°C. After the incubation period, the number of viable cells in the suspension was evaluated. In liquid culture assay, growth inhibition was measured at A600 nm up to 6 h in bacterial suspensions treated with the eluates of the restorative materials. Statistical Analysis: Kruskal–Wallis test and Mann–Whitney's test were performed to determine the significant differences between the control and restorative materials for given incubation periods at 5% level of significance (P < 0.05) Results and Conclusion: After 6 h of incubation, all restorative materials showed an inhibitory effect when compared to the controls. 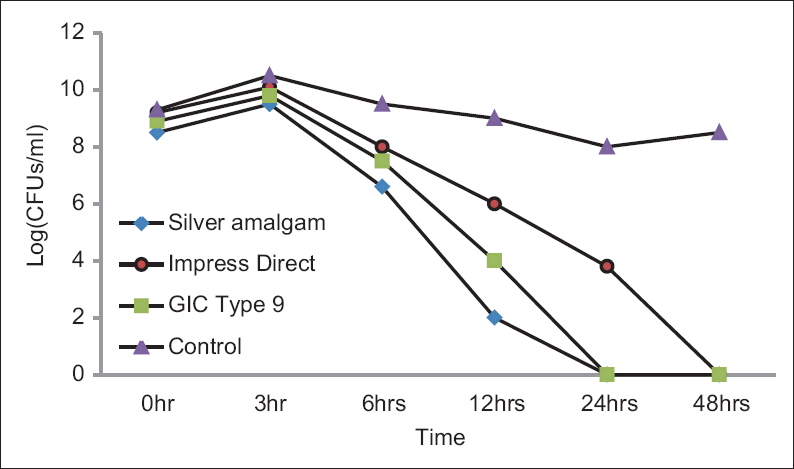 Silver amalgam showed the highest inhibition, followed by GIC Type 9 and composite. Silver amalgam showed marked inhibition after 2 h in comparison to the other material groups. These techniques employed to study the antibacterial effects showed that the silver amalgam had the pronounced inhibitory effect followed by GIC and composite. Further research on these aspects is necessary to determine whether the material can prevent secondary caries formation. Purpose: The aim of this in vitro study was to evaluate the color stability and degree of conversion (DC) of dual-cure and light-cure cements and flowable composites after thermal aging. Materials and Methods: A total of 50 human incisors were prepared and divided into six groups (n = 10). Veneers were fabricated using IPS Empress Direct composite resin were bonded with three types of luting agents: Light-cured, conventional dual, and flowable composite according to the manufacturer's instructions. The groups were as follows: Filtek Z350XT Flow/Single Bond 2, RelyX ARC/Single Bond 2, RelyX Veneer/Single Bond 2, Tetric N-Flow/Tetric N-Bond, and Variolink II/Tetric N-Bond. Commission Internationale de l'Éclairage L*, a* and b* color coordinates were measured 24 h after cementation procedure with a color spectrophotometer and reevaluated after 10,000 thermal cycles. To evaluate the DC 50 specimens (n = 10) of each resin material were obtained and Fourier transform infrared spectroscopy was used to evaluate the absorption spectra. Statistical analysis was performed with one-way ANOVA and Tukey's test (α = 0.05). Results: No statistically significant differences in ΔE* occurred after aging. The greatest change in lightness occurred in the Variolink II resin cement. Changes in red–green hue were very small for the same cement and largest in the Tetric N-Flow flowable resin composite, while the greatest change in blue–yellow hue was a yellowing of the RelyX ARC luting cement. RelyX ARC exhibited the highest DC, and there were no statistically significant differences in DC among the other cements. Conclusions: Resin-based luting agent might affect the final of ceramic veneer restorations. The thermal aging affected the final color of the evaluated materials, and these were regarded as clinically unacceptable (ΔE >3.3). Aim: The current study compared the fracture resistance of samples instrumented by two rotary files and a reciprocating file, obturated with gutta-percha and AH Plus. Materials and Methods: A total of 60 freshly extracted mandibular premolar teeth with single roots and single canals were acquired and decoronated at or below the cementoenamel junction. The samples were randomly divided into four groups (n = 15). Group 1 control (noninstrumented/obturated), and for Groups 2–4 root canal instrumentation was done by EndoStar E5 (EE5), ProTaper NEXT (PTN), and WaveOne, respectively. Following instrumentation, the samples were obturated using gutta-percha cones and AH Plus sealer using lateral compaction. A week later, vertical load was applied to the specimen's canal in each group until fracture. The loads required for fracture were recorded and statistically analyzed. Results: The mean loads required to fracture (Newton; N) for the four groups were; 388.54 (±29.93), 310.35 (±26.05), 328.40 (±20.67), and 278.54 (±34.16). The loads exhibited highly significant difference (P < 0.0001; analysis variance). The following Tukey's post hoc test confirmed, both samples in Groups 2 and 3 required similar loads for fracture (P > 0.05) and significantly higher than Group 4 (P < 0.01). Conclusion: The samples instrumented by EE5 and PTN exhibit similar fracture resistance. Context: Root canal anatomy is evaluated using different methodologies. Aims: The aim of this study is to evaluate and classify root canal morphology and dentin thicknesses (DT), comparing radiographic and micro-computed tomography (CT) analysis. 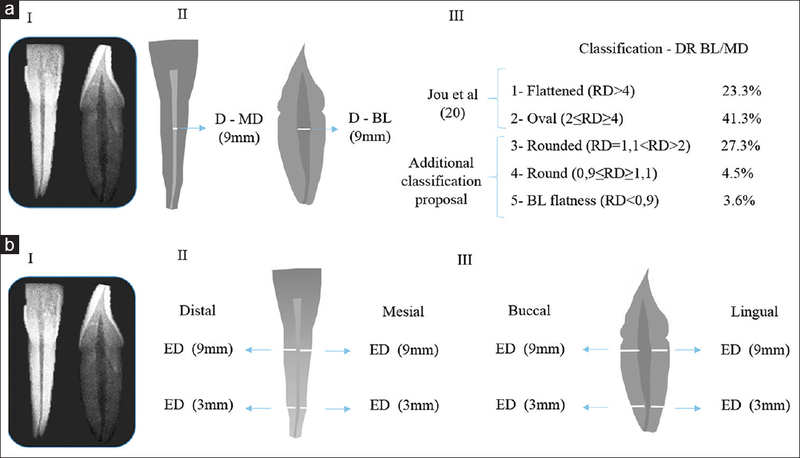 Materials and Methods: Canal diameter and DT of mandibular incisors (n = 520) were evaluated using digital radiographs in buccolingual (BL) and mesiodistal (MD) directions. The diameter ratio (DR) BL/MD was classified: flattened (FL, DR >4); oval (OV, 2≤ DR ≥4); rounded (RN, 1.1< DR >2); round (RO, 0.9≤ DR ≥1.1); and with BL flatness (BL, DR <0.9). OV (n = 110) were subjected to micro-CT. DT and DR were evaluated at 3, 6, and 9 mm. ANOVA, Tukey, and paired Wilcoxon tests (P < 0.05) were used. Results: Radiographic classification was 23.3% FL, 41.3% OV, 27.3% RN, 4.5% RO, and 3.6% BL. DT was similar. Radiographic DT at 3 and 9 mm was greater than micro-CT (P < 0.05) and was similar at 6 mm (P > 0.05). DR differed between the analyses. Oval canals were predominant at all levels radiographically and at 9 and 6 mm in micro-CT analysis, with greater variation at 3 mm. Conclusion: Oval root canals are predominant in mandibular incisors at 9 mm. Radiographic DT is larger than observed in micro-CT at 3 and 9 mm, and the classification differed in each root level. The classification at 9 mm is indicated. Background: Intraradicular procedures remove radicular dentin and jeopardizing longevity of a tooth. Traditional in vitro methods used to determine the remaining dentin thickness (RDT) have limitations. Aim: The aim is to evaluate, using cone-beam computed tomography (CBCT), RDT following rotary instrumentation and post space preparation in buccal and palatal roots of maxillary first premolars. Materials and Methods: Twenty-three maxillary first premolars with two roots were selected. CBCT images were taken preoperatively, after instrumentation and Parapost 3 and 4 preparation (CBCT 1, 2, 3, and 4). RDT was measured 5 mm above apex, 1 mm below furcation, and 1 mm above furcation (Levels 1, 2, and 3). Data were analyzed using ANOVA and post hoc Tukey's test (P = 0.05). Results: Rotary instrumentation and post space preparation reduced RDT in all walls of buccal and palatal roots. Post space preparation with Parapost 3 and 4 reduced RDT in the palatal wall of buccal root to <1 mm and Parapost 4 reduced all walls to 1 mm of dentin. Conclusion: Post space preparation in maxillary first premolars should be performed cautiously. It is safer to place a post in the palatal root of this tooth and limit preparation to Parapost 3. Aim: The aim of this study is to compare and to evaluate effect of curing light and curing modes on the nanohybrid composite resins with conventional Bis-GMA and novel tricyclodecane (TCD) monomers. Methodology: Two nanohybrid composites, IPS empress direct and charisma diamond were used in this study. Light-emitting diode (LED)-curing unit and quartz-tungsten-halogen (QTH)-curing unit which were operated into two different modes: continuous and soft start. Based on the composite resin, curing lights, and mode of curing used, the samples were divided into 8 groups. After polymerization, the samples were stored for 48 h in complete darkness at 37°C and 100% humidity. The Vickers hardness (VK) of the surface was determined with Vickers indenter by the application of 200 g for 15 s. Three VK readings were recorded for each sample surface both on top and bottom surfaces. For all the specimens, the three hardness values for each surface were averaged and reported as a single value. The mean VK and hardness ratio were calculated. The depth of cure was assessed based on the hardness ratio. Results: Comparison of mean hardness values and hardness ratios was done using ANOVA with post hoc Tukey's test. Conclusion: Both QTH- and LED-curing units had shown the adequate depth of cure. Soft-start-curing mode in both QTH- and LED-curing lights had effectively increased microhardness than the continuous mode of curing. TCD monomer had shown higher hardness values compared with conventional Bis-GMA-containing resin. Purpose: The purpose of this study is to compare the physical, mechanical, and biocompatibility properties of a new dual-cure white mineral trioxide aggregate (D-W-MTA) and a commercial W-MTA. Materials and Methods: Diametral tensile strength (DTS), water sorption (WSp), and water solubility (WSl) tests were performed. Cytotoxicity was observed in primary culture of human pulp fibroblasts (HPFs) and mouse 3T3/NIH fibroblast lineage. Specimens of both materials were embedded in 1 mL of Dulbecco's modified essential medium for 24 h. Cells were incubated for 24 h with the eluates. Cytotoxicity was evaluated by the 3-(4,5-dimethylthiazol-2-yl)-2,5-diphenyltetrazolium bromide assay and genotoxicity by micronucleus (MN) formation. Data were analyzed by ANOVA and Kruskal–Wallis tests considering P < 0.05. Results: D-MTA and W-MTA not showed cytotoxic effect on the two cell lines. However, D-MTA stimulated HPF growth. The MN count was similar to that of the control group for D-MTA and W-MTA. D-MTA presented lower DTS and WSl. Nevertheless, WSp was similar in the two groups. Conclusion: The results suggest that D-MTA is a promising material for pulp capping. Thus, in vivo tests should be performed to evaluate the performance of this material. Context: One of the important goals of root canal therapy is disinfection aided by irrigation and intracanal medicaments. Commonly used nonsteroidal anti-inflammatory agents have shown anti-bacterial activity, thus, when used as intracanal medicaments, nonantibiotic agents have the potential to provide anti-inflammatory, local analgesic, and anti-bacterial activity. Aim: The aim of this study is to evaluate and compare the anti-bacterial efficiency of anti-inflammatory nonantibiotics ibuprofen and diclofenac, and routinely used intracanal dressing calcium hydroxide (Ca[OH]2), against Enterococcus faecalis, in an endodontic model. Materials and Methods: A total of 76 single-rooted mandibular premolar teeth were decoronated and instrumented up to F4-ProTaper rotary. Apical foramen was sealed with composite resin, and all external surfaces made impermeable with nail varnish, except for coronal access. Roots were autoclaved (121°C for 20 min), placed in Eppendorf tubes, and contaminated with E. faecalis for 14 days. 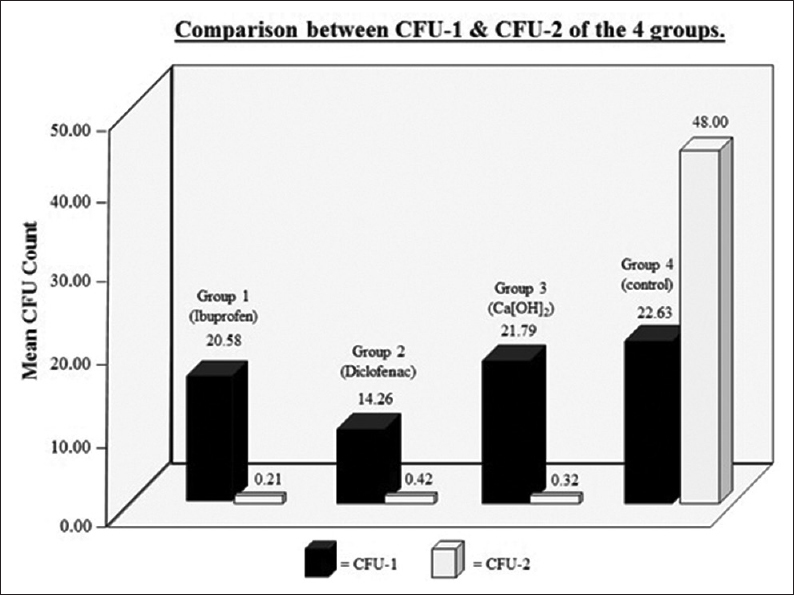 Colony-forming unit (CFU) counts were taken before (CFU-1), and after intracanal medication (CFU-2) by paper point sampling. Test medicaments (Group-1: ibuprofen, Group-2: diclofenac, Group-3: Ca[OH]2) were mixed with distilled water (1:1 w/v), placed into root canals, temporarily sealed, and incubated (37°C; 7 days). Group-4 received no medicament (control). Kruskal–Wallis ANOVA was used to compare the four groups and Mann–Whitney U-test for pair-wise comparisons. Results: Within the limitations of the study, anti-inflammatory nonantibiotics (ibuprofen; diclofenac) were shown to have anti-bacterial effect against E. faecalis. Conclusion: Since nonsteroidal anti-inflammatory drugs (NSAIDs) have an anti-bacterial effect, it is possible to replace Ca(OH)2with NSAIDs, or even combine them to form a cocktail of local disinfectants to optimize canal disinfection. Background: Complete seal at dentin-sealer-core interface of the root canal is required to maintain long-term periapical health. Aim: The aim of this in vitro scanning electron microscopic (SEM) study was to determine which of the commonly used root canal sealer among AH-Plus, GuttaFlow, and RealSeal provides a superior marginal adaptation with the dentin in the apical third region of root canals. Materials and Methods: Selected 30 human freshly extracted maxillary central incisors were biomechanically prepared, then divided equally into three groups and obturated with AH-Plus, GuttaFlow, and RealSeal using single-cone obturation technique. 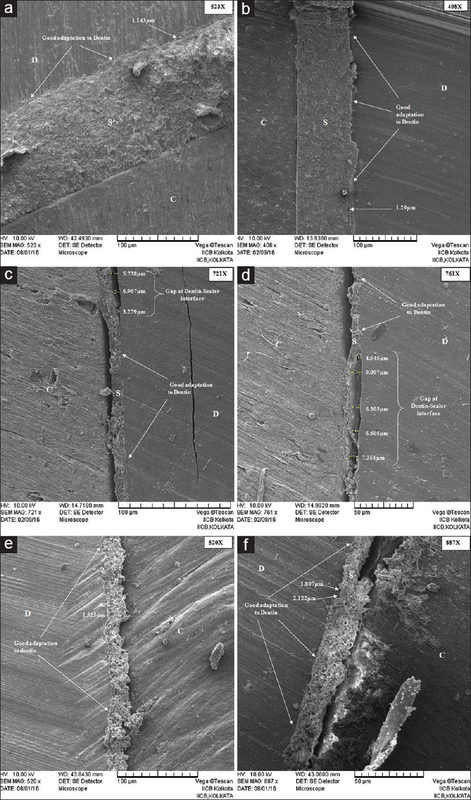 After sectioning longitudinally, apical third of the roots was observed under SEM; dentin-sealer-core interface was focused. Marginal adaptation and interfacial gaps at dentin-sealer interface of all the samples were evaluated and analyzed statistically in this part of the article. Statistical Analysis Used: Analysis of variance and post hoc Tukey's test. 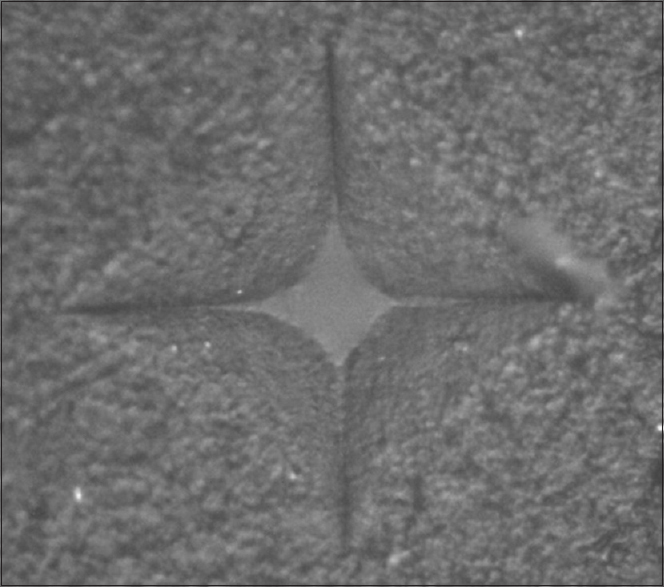 Results: GuttaFlow exhibited least average marginal gap of 2.38 ± 1.43 μm, followed by AH-Plus (4.11 ± 2.85 μm) and RealSeal (4.65 ± 3.91 μm) with no significant difference (P > 0.05) among the groups. Conclusions: As the dentin-sealer interfacial gap is seen to be minimum in GuttaFlow, it is better adapted to dentin in the apical third of root canals compared to AH-Plus and RealSeal. Background: Not only the gaps at dentin-sealer interface but also at core-sealer interface may jeopardize the outcome of root canal treatment. Aim: The aim of this in vitro scanning electron microscopic (SEM) study was to determine which root canal sealer among AH-Plus, GuttaFlow, and RealSeal provides a superior marginal adaptation with the core obturating material in the apical third region of root canals. Materials and Methods: Selected 30 human freshly extracted maxillary central incisors were biomechanically prepared, then divided equally into three groups and obturated with AH-Plus, GuttaFlow, and RealSeal using single cone obturation technique. After sectioning longitudinally, apical third of the roots were observed under SEM dentin-sealer-core interface was focused. Marginal adaptation and interfacial gaps at core-sealer interface of all the samples were evaluated and analyzed statistically in this part of the article. Statistical Analysis Used: Analysis of variance and post hoc Tukey's test. Results: Mean average gap was significantly higher (P < 0.05) for AH-Plus (15.65 ± 10.48 μm), when compared to GuttaFlow (3.51 ± 1.81 μm) and RealSeal (6.01 ± 2.51 μm). Between RealSeal and GuttaFlow, the latter showed least marginal gap; however, this difference was not statistically significant (P > 0.05). Conclusions: GuttaFlow is better adapted in the apical third of root canals among 3 sealers. Aims: The aim of the study was to evaluate the effect of 10% sodium ascorbate (SA),10% hesperidin, 1% riboflavin 5-phosphate, collagen cross-linkers, on the pushout bond strength of the fiber resin postluted to the radicular dentin. Materials and Methods: Twenty-eight, single-rooted extracted human teeth were collected. The cleaning shaping and obturation was done followed postspace preparation which was etched with 37% phosphoric acid for 15 s and then rinsed with normal saline. The specimens were divided into four groups and postspaces were irrigated, respectively with. (i) Group 1: Normal saline for 4 min, (ii) Group 2: 10% SA for 4 min, (iii) Group 3: 10% hesperidin for 4 min, and (iv) Group 4: 1% riboflavin 5 phosphate (RFV) for 4 min. The pushout bond strength of fiber postluted to root dentin, of all the above groups, was compared. Posts were luted using Rely X Arc luting cement. Each root was horizontally sectioned to obtain 2 mm thick, 28 dentinal disks, per group. The pushout bond strength test was carried out using Universal Testing Machine. The scores were statistically analyzed using Student's Unpaired “t” and ANOVA test. Results: Comparison of different collagen crosslinker showed that the highest pushout bond strength value was recorded with 10% hesperidin, followed by 1% RFV and 10% SA. Conclusion: All collagen cross-linkers so used, increased the bond strength. The highest push-out bond strength was achieved with 10% hesperidin. Objective: The effect of 10% sodium ascorbate, 10% α-tocopherol, 10% grape seed extract, and 10% guava seed extract solutions on the shear bond strength (SBS) of composite resin to bleached enamel was evaluated. Materials and Methods: Labial enamel surfaces of 72 extracted maxillary central incisors were bleached using 37.5% hydrogen peroxide. Sixty-four specimens were divided into four experimental groups (Group I–IV) comprising 16 specimens each and remaining eight specimens were placed in Group V. Groups I–IV were further divided into 2 subgroups: A (10 min) and B (120 min) comprising 8 specimens each. Eight unbleached specimens served as control (Group VI). Immediately following bleaching, Groups IA–IVA and IB–IVB specimens were treated with respective antioxidants for 10 min and 120 min. All specimens were then bonded with composite resin. Specimens were stored in distilled water for 24 h. SBS testing was done. Data were tabulated and subjected to statistical analysis using ANOVA and Tukey's honest significant difference test. Results: Group VI (unbleached) showed the highest SBS followed by Group IV (10% guava seed extract). Conclusion: Use of antioxidants effectively reversed the compromised bond strength of bleached enamel. About 10% guava seed extract application after bleaching showed best bond strength. Treating pathological defects that are caused by resorption in teeth can be challenging. The task is complicated further if the resorption extends beyond the restrains of the root. The aim of this report is to describe a case of extensive internal tunneling resorption (ITR) associated with invasive cervical resorption (ICR) in a maxillary right lateral incisor and its nonsurgical treatment. A 22-year-old male was referred to the department of endodontics with a chief complaint of discolored maxillary right lateral incisor or tooth 12 and a history of trauma. An extensive ITR associated with ICR accompanied by apical periodontitis was detected on a preoperative radiograph which was confirmed on a cone-beam computed tomography (CBCT) scan in a maxillary lateral incisor. After chemomechanical debridement and withdrawal of a separated file in the canal, calcium hydroxide was placed as an intracanal medicament for 2 weeks. Biodentine (BD) was used to obturate the defect as well as entire root canal system and to restore ICR. 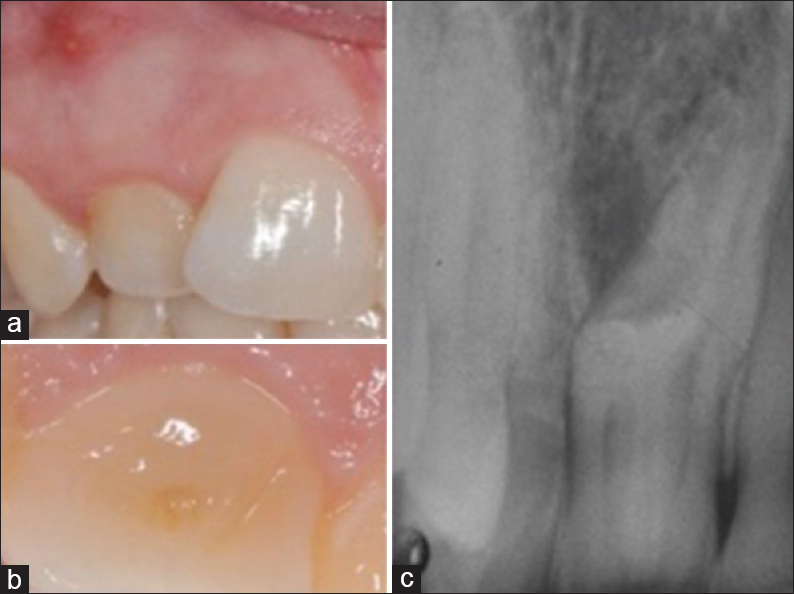 On a 5-year follow-up, the tooth was functional, and periapical healing was evident. Based on results of this case, successful repair of ITR associated with ICR with BD may lead to resolution of apical periodontitis. 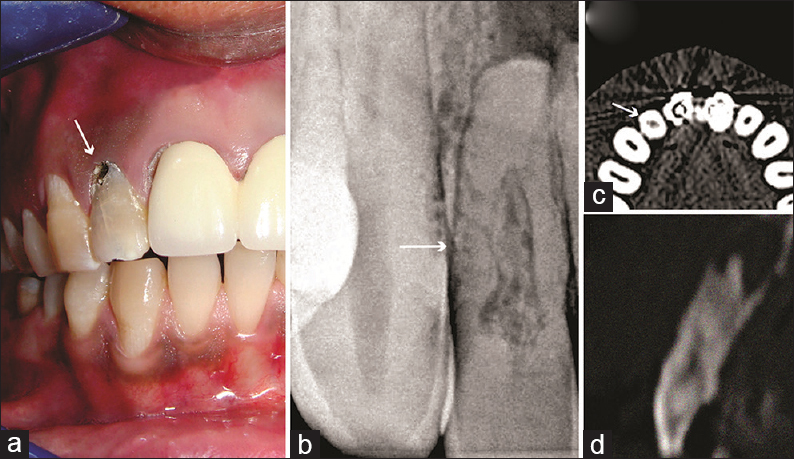 Trauma to teeth may lead to resorption which may be internal, external, and or a combination of both which may be asymptomatic in some patients. Preoperative assessment using CBCT imaging achieves visualization of location and extents of resorptive defects. Bioactive materials like BD may lead to favorable results in treating such extensive defects. Dens invaginatus (DI) is a dental malformation occurring in several morphologic types. Consequently, treatment of teeth affected by DI can get complicated because of the complex root canal anatomy. The aim is to describe how to manage a rare report of a DI with necrotic pulp held within the vital pulp of a maxillary lateral incisor. Oral fistula was found on the buccal mucosa of the apex of the vital maxillary lateral incisor with a DI having necrotic pulp. Endodontic treatment of the maxillary lateral incisor and of the tract canal of DI was realized. Clinical disappearance of oral sinus tract was observed after 10 days. On the contrary, the disappearance of radiolucent area occurred after 6 months. A proper and prompt diagnosis is necessary to carry out effective prevention protocols or prevent consequences generating nonrecoverable endo-perio diseases.